Fly from Glasgow via Dublin to Orlando with Aer Lingus. One of the world's most visited family destinations, and while its illustrious theme park attractions may steal the limelight, with a vibrant and well-kept city centre and a climate that averages around 25° Celsius (75° Fahrenheit), there is a surprising amount of things to experience here. Grab yourself a cheap flight to Orlando and discover how easy it is to travel to North America with Aer Lingus. Connect in Dublin Airport’s Terminal 2 and pre-clear U.S. immigration before boarding your flight - that means you can grab your bags and go when you land in Orlando! 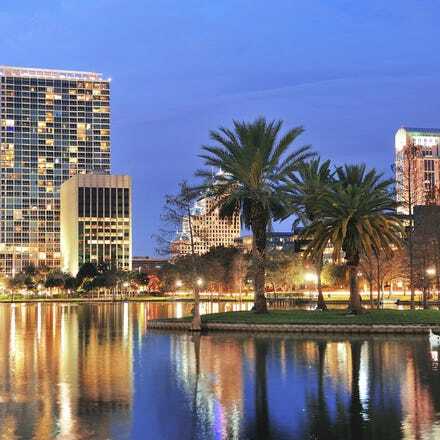 Widely recognised as a city with a booming tourist industry and an international theme park destination, Orlando is all that and much more for the savvy traveller. With shopping deals, boutique hotels that cater to your every whim, and restaurants catering to every taste imaginable, Orlando is just as much a city for grown-ups to come and play as it is for the children. As the city's motto goes, "Say Yes to Orlando." 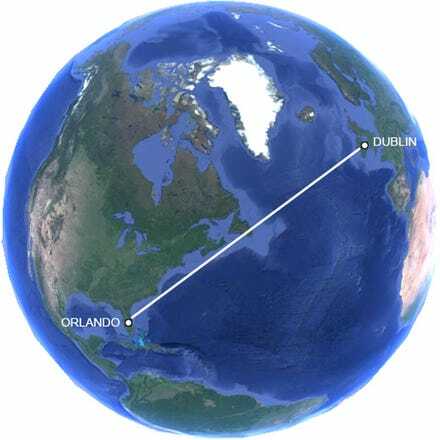 All Aer Lingus flights to Orlando arrive at Orlando International Airport (MCO), which is located approximately 9 miles southeast of downtown Orlando or 14 miles east of the International Drive area where the majority of theme parks are located. Lynx bus lines 11, 51, 42, 111 and 407 connect the airport and the city centre. LYNX is a regional bus service in central Florida including Orlando. You can either buy a single ride or buy a 7-day pass. You can buy your tickets on the web or from certain outlets in the area. The I-RIDE Trolley is a convenient and affordable transportation service to destinations within the International Drive Resort Area. Fares include taxes, charges and admin fee and are on an each-way basis, when purchased as part of a return trip. Subject to terms, conditions and availability.